I needed a simple, stockinette-based edging for a chair arm cover I wanted for my knitting chair (which naturally gets an awful lot of wear...). 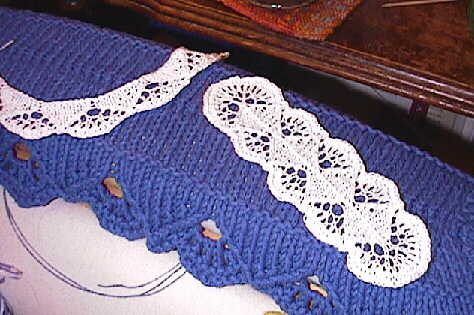 I didn't want to mess with knitting on an edging, or with the fussy crocheting-off that so many edging patterns use. I just wanted to knit it and bind it off. Here it is! This pattern is worked back and forth on a multiple of 9 stitches. Changes for circular knitting follow. Cast on 9 stitches per repeat (that is, per triangle desired). Row 1: *ssk, k5, k2tog, yo; repeat from *, omitting final yo. Row 2: purl, working (p1, k1) in yo. Row 3: *ssk, k3, k2tog, (yo, k1) twice, yo; repeat from *. Row 5: *ssk, k1, k2tog, (yo, k1) 5 times, yo; repeat from *. Row 6: *p3, k 11; repeat from *. Row 7: *sl 1, k2tog, psso, yo, k 11, yo; repeat from *. Row 8: bind off loosely. One warning: the natural shape of the scallop is wider than necessary to produce the scallop. Unblocked the pattern will produce a wavy bell ruffle--which may be what you want! If blocked flat it will want to curve, as shown in the photo below. Note: you can work rows 7 and 8 in a contrasting color to emphasize the scalloped edge. Descriptions for knitting a circular band and for knitting a bookmark follow. To work this edging in the round, cast on 9 sts per repeat, bring the ends together and knit one round to establish the circle. Follow instructions for the back-and forth version with the following changes: On Round 1, do not omit the final yo. On even numbered rows, knit where it says purl and purl where it says knit. Bind off by purling rather than knitting. ©Judy Gibson, 2002. Permission granted for any use you like, as long as credit is given in any published patterns to me as designer of the edging.